There’s no room for slip-ups where wardrobe staples are concerned. When something’s simple – like a button-down shirt, tee or jeans – every element has to be perfect. So you’d be forgiven for thinking the high street isn’t the smartest choice for serious, takes-a-beating denim. If you’re put off by the idea of rails of neon skinnies and piles of jeggings, think again: big-name retailers have upped their game and their purchasing power means it’s easy to score premium fabrics and detailing on the cheap. Following our previous high street hit lists – on where to buy the best tees and leather jackets – here are the best stops for affordable, well-built denim. Marks & Spencer and selvedge denim aren’t necessarily two terms you’d put together. But the shop better known for posh lunchtime options has thrown a curveball with its value-for-money selvedge collection for AW16. Selvedge means the edge of the denim has been constructed to prevent fraying, usually with a red and white fabric border. It’s expensive stuff as the material has to be woven in slimmer rolls and is usually crafted on older looms. But for a product that usually starts in the £100s, M&S’ range is a snip, with pairs from just £60. 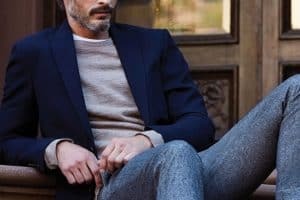 If that doesn’t grab you, the collection includes jeans with fabric from three of the world’s best mills: America’s 125 year-old Cone Denim; Italy’s family-run, sustainable Candiani Denim mill; and Japan’s Kurabo, one of the longest-running producers in the game. So now you can pick up a menswear staple as well as a meal deal. How much? From £15; Japanese selvedge styles from £60. Like most wardrobe basics it turns its hand to, Uniqlo aces denim. Since 2009, the brand has made jeans using its homeland’s Kaihara denim – the Japanese mill famed for its rope-dyeing technique. What does that mean for your wardrobe? Sturdy jeans in a spectrum of blues and all for the price of a round of drinks. The brand’s marketing is confusing though, and you’ll have to look out for the Kaihara label inside to check exactly where yours came from. Other designs show off Uniqlo’s fabric innovation, like a two-way stretch option and ‘Miracle Air’, a summer-friendly pair that’s 20 per cent lighter than your average pair of jeans. And of course, the retailer’s Heattech technology even extends to its denim line. Not to be forgotten is a free same-day alterations service in every store, so no more scouring through piles searching for exactly the right size. A true denim OG, Edwin’s jeans might not come cheap but in cost-per-wear terms, they’re a smart buy you’ll keep for years. Founded in Japan in 1947 when the country’s homegrown denim was somewhat lacking, the brand innovated right out of the gate, introducing rainbow selvedge and inventing stonewashing. Yup, you can blame all your 1980s flashbacks on Edwin. Today it’s cultivated an uncluttered, simple, and not-too-skinny aesthetic. Relaxed, tapered silhouettes are the brand’s strong suit, and each design is replete with detail from custom rivets to intricate stitching. If you favour the distressed look, Edwin practically invented the concept of pre-worn jeans and each scuff and tear is perfectly considered. Once the home of trashed skinnies and reality TV star-cutoffs, River Island has levelled up its fashion credentials recently, overhauling its denim offering in the process. 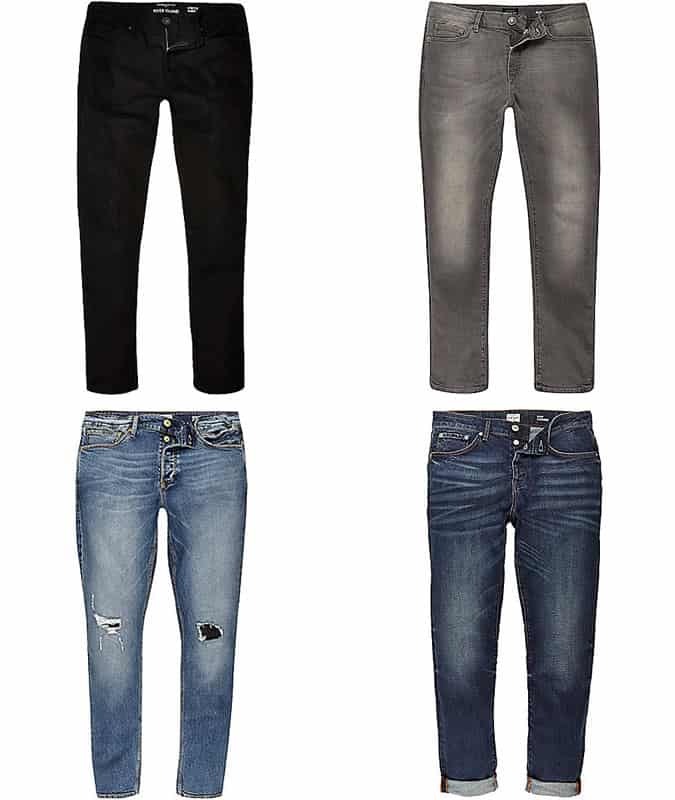 The array of fits has been reduced to key styles that cater to the way guys really wear jeans: you’ll find Dylan for slim, Sid for stretch-skinny, Curtis for slouchy and so on. Most hover around the £30-35 mark but you won’t see any above £60, making this a good stop-off if you want to experiment with styles. The more expensive versions borrow a trick from women’s jeans, harnessing ‘extreme stretch’ that snaps back to shape after wear, meaning no sagging or bagging, as well as supreme comfort – especially if you’re between sizes (plus, no more loosening your belt after a burger). Nudie’s jeans feel right from the first touch. The denim’s substantial in a way that fans of high-end labels will recognise and that’s partially due to it being 100 per cent organic, with much of the manufacture taking place in Italy. Famous for skinny jeans that are designed to break in and soften over their lifespan, the Scandinavian label pays all its workers a living wage, and aims to be sustainable at every level of the production cycle. They even provide a repair service, no matter how old your Nudies. Bring a (clean) pair to one of their Repair Shops and they’ll patch them up for you, no questions asked. Best for: A clear conscience.